It is easy to forget the wealth of benefits that exercise can bring, helping to regulate everything from heart health to hair loss. However, a recent study from the University of Arizona has revealed how exercise-related social media posts can make people more self-conscious. According to Stephens Rains, co-author of the study, “People are especially likely to feel concerned about their weight when they perceive their friends who post about physical activity as being very similar to themselves”. Rains concluded, “Good can come out of this, in the sense that it can make some people more interested in exercising and feel better about exercising, but it might make other people feel worse about themselves if they’re more concerned with weight”. These findings reveal that many people can develop an uneasy relationship with exercise. However, it is crucial to not let social media affect whether or not we work out, due to the wealth of benefits, not least for hair growth and hair loss prevention. Exercising regularly maintains good circulation and a healthy heart, allowing for robust blood flow to the scalp. 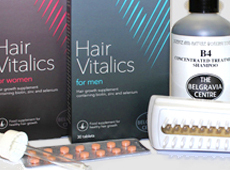 This is key for delivering the nutrients used by follicles to maintain healthy hair growth. While exercise does not cure baldness, it is known to reduce stress which is known to accelerate the two most common hair loss conditions – Male Pattern Baldness and Female Pattern Hair Loss. Sudden, intense stress or trauma may also trigger the autoimmune disorder Alopecia Areata. A 2012 report in the Deccan Herald warned men and women that regular excessive exercise had the potential to cause Telogen Effluvium, a temporary hair loss condition which disrupts the hair growth cycle, forcing hair follicles to enter their normal ‘resting’ phase early. It is worth noting that there is a big difference between pushing yourself during a session and over-training on a regular basis. Dr Manoj, a hairloss expert interviewed by the Indian newspaper, explained that,“When the body is subjected to extreme stress, an unusually high number of hairs prematurely enter a phase of rest, called the telogen phase. These hairs begin to fall, causing a heavy hair fall”. Furthermore, frequent intense anaerobic workouts that are designed to build body mass are considered more likely to speed up hair loss in cases of male and female pattern baldness – aerobic exercise may be more beneficial in its contribution towards healthy hair. Although it will usually clear up naturally within six months, once the underlying issue has been resolved, Telogen Effluvium treatment at Belgravia is possible. This centres around using appropriate solutions of high strength minoxidil, which are applied topically to affected areas of the scalp. Whilst Telogen Effluvium is temporary, the condition can also accelerate hereditary, permanent forms of hair loss in those with an existing genetic predisposition, namely Female Pattern Hair Loss and Male Pattern Baldness. A March 2017 UK poll conducted by Hammerson discovered the 39 per cent of respondents from the South East exercised four or more times per week. However, moderation – or at least mixing up the intensity – is important when it comes to fitness. Dan Mennell, a certified personal trainer at Run Jump Lift UK, emphasises the way in which stress and exercise can exacerbate the balding process: “exercise stress doesn’t exist independently of other stresses in your life. If you’re stressed and tired, you simply can’t handle exercise stresses and adapt positively to them. This can lead to less desirable outcomes and definitely start to contribute towards problems such as hair loss”. For people in this position, he advises limiting workouts to two sessions a week: “If you’re suffering from a lot of stress in your day-to-day life, cutting back on exercise intensity or the number of training days is sensible as it reduces the amount of stress”. Mennell continues, “Many people also find that more frequent bouts of lower intensity activity such as frequent walking, stretching or yoga can be very beneficial not only for maintaining fitness but also minimising and reducing stress”. Many yoga enthusiasts have claimed that performing headstand positions can encourage hair growth, the argument being that these positions increase blood flow to the head. While yoga is unable to directly prevent the onset of genetic hair loss, it can help to reduce certain lifestyle factors which accelerate it, namely stress. Social media has given people a platform to upload their fitness regimens and diet plans to a wide audience, which for many viewers is a source of inspiration. For others, however, it can be a source of discouragement and frustration. Don’t allow yourself to become put off or stop exercising – whether visiting the gym, attending classes or taking part in sports – because of images you see on the internet. Everyone’s journey is different and it is important for our overall well-being – both mental and physical – to exercise in as healthy a way as possible. While the potential of experiencing or accelerating many hair loss conditions can be limited by reducing stress. There are no lifestyle measures that can permanently prevent the onset of genetic conditions. Should excessive shedding become a problem, the best option is to seek advice from a professional specialist who can provide a diagnosis and, where appropriate, personalised recommendations for hair loss treatments and additional hair growth boosters tailored to their findings.